Olive oil is a hotter commodity than ever thanks to research linking it to good health and wellness. More good news: No longer do you have to look outside the United States for this flavorful oil; California is bringing the good stuff to you. This past May in Paso Robles, Calif., the olive trees at Clotilde and Yves Julien’s Olea Farm were basking in the warm spring sunshine. The stretch of rolling hills striped with neat rows of olive trees and grape vines seemed more like Tuscany than the central coast region of California. Yet Paso Robles, like other regions in California, is developing quite a reputation for producing fine olive oil. And why shouldn’t it? According to Julien, California shares many climatic and geographic similarities with regions in Europe that have been growing olives for centuries. As he bent down to show me a scoop of the dry, sandy soil, he chuckled, “Olive trees don’t need much, just lots of sunshine.” If you’ve ever seen olive trees clinging to the steep, rocky inclines of the southern Italian coast off the Mediterranean Sea, you’d understand what he was talking about. Indeed, olive trees don’t need much more than a mild winter and long, hot, dry summers. No wonder they thrive in California. The California olive oil industry is nothing new. People have been growing olives here since the 18th century, and the California Olive Oil Council has been representing California olive oil producers for nearly 20 years, from California Olive Ranch—the largest producer in the state—to small ranches that produce only 40 gal per year. And the industry is growing by leaps and bounds. “The California olive oil industry grows by double digits every year,” says Patricia Darragh, executive director of the California Olive Oil Council. “We’ve now surpassed French production.” The estimated olive oil production during this past winter’s harvest was 1.2 million gal. Darragh reports that you can find California olive oil on store shelves all over the county, particularly on the west coast and in large urban areas. While olive trees are being grown elsewhere in the United States, such as Texas, Arizona, and Oregon, California boasts the lion’s share of the country’s production at 99.9%. Darragh reports that, considering California’s status as one of the most robust economies and agricultural centers of the world, it’s only fitting that it would be known for olive oil. “People know that California has great wines, and now olive oil,” she adds. The future for olive oil in California is so promising that the University of California (UC) Davis Olive Center at the Robert Mondavi Institute was established in 2008 to build a strong relationship between the university and industry, as well as provide research and education on olive oil agriculture. The UC Davis Olive Center aims “to do for table olives and olive oil what UC Davis did for wine,” according to its mission statement. Indeed, the Robert Mondavi Institute, founded with a $25 million gift from winemaker Robert Mondavi in 2001, has had a significant impact on the field of viticulture. The UC Davis Olive Center has conducted research in better growing, pest management, harvesting, and processing techniques, as well as establishing an internationally accredited sensory laboratory called the UC Davis Olive Oil Taste Panel, which has received accreditation from the International Olive Council in Madrid as one of 47 accredited panels worldwide and the only one in North America. Darragh reports that the California Olive Oil Council worked for five years to get the USDA to revise the U.S. grading standards for olive oil to conform to current industry standards commonly accepted in the United States and abroad. The revised standards, which were approved in October 2010, provide a common language for trade and give consumers quality assurance when they buy olive oil. Included in the revised standards are objective criteria for the various grades of olive oil, including definitions for extra-virgin olive oil, virgin olive oil, olive oil, refined olive oil, and olive pomace oil. In addition, the standards promote truth in labeling by providing state and federal agencies a basis for enforcement if products are mislabeled. “The standards will have a big impact on imported oils,” Darragh predicts. However, the new standards are voluntary, which means producers can choose whether or not to seek USDA certification. If a producer wants to certify its product as U.S. Extra Virgin Olive Oil, it can have oil samples analyzed and inspected by the USDA. Certified oils bear the USDA certification seal. There’s another way to ensure you’re getting great quality virgin olive oil grown in California. Look for the California Olive Oil Council Certified Extra Virgin Seal (www.cooc.com/producers_certified.html). Producers must comply with the council’s following standards in order for products to bear the seal: Olives must be mechanically extracted without chemicals or excessive heat, oil contains less than 0.5% free oleic acid, and oil has positive taste elements and no taste defects, as determined during a blind tasting. If you think wine tasting is de rigueur, you should try olive oil tasting. Today, many gourmet food shops invite you to sample olive oil, encouraging you to discover the wide range of flavors that can lend a distinctive flair to foods. And if you visit any California olive oil ranch, you’ll likely be invited to sample the golden-green liquid on the spot. There are nearly as many varieties of olives grown in California—more than 50 in fact—as there are grapes. These olive varieties hail from all over the world—from Spain and Greece to Italy and France. A wide range of flavors may be found in extra-virgin olive oils, which are determined by factors such as the type of olives, ripeness of olives, growing conditions, and oil storage. Olive oil tasting can be serious stuff, not unlike a professional wine tasting. Olive oil characteristics such as “apple,” “fruit,” and “grass” often are mentioned during such tastings. At Olea Farm, my sampling experience was simple. I sipped tastes from various bottles, favoring an Arbequina, which is an early harvest Spanish olive variety that’s sweet yet pungently hot at the back of my throat, a sensation I liked. And it’s this pungent taste that has some researchers talking about the unique health properties of olive oil. 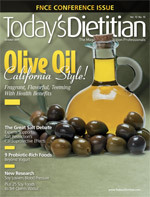 In a September 2005 study published in Nature, researchers discovered that newly pressed extra-virgin olive oil contains oleocanthal, the compound whose pungency induces a strong stinging sensation in the throat, not unlike that caused by the nonsteroidal anti-inflammatory drug (NSAID) ibuprofen. “This is a bitter tasting compound that can act to decrease inflammation in the same way that nonsteroidal anti-inflammatory drugs do. The intake of NSAIDs have been related to a decrease in breast cancer risk and breast cancer recurrence,” reports Mary M. Flynn, PhD, RD, LDN, research dietitian at The Miriam Hospital, and an assistant professor at Brown Alpert Medical School. Flynn is an expert in the field of nutrition research, specializing in the benefits of the Mediterranean diet and olive oil. When you think of olive oil benefits, you usually think of heart health. But research also has shown a link between olive oil intake and decreased cancer risk—in particular breast cancer. “Studies from Italy, Spain, and Greece that were published in the mid-1990s indicate olive oil consumption protects against breast cancer. In fact, the studies from Italy and Spain indicated there was a dose response protection,” Flynn says. In addition, a February 2000 study published in QJM found a beneficial effect of oleic acid (found in olive oil) on insulin sensitivity. While new research is turning up fascinating discoveries about olive oil, people have been celebrating its health benefits throughout history. Olive oil has been relied upon to maintain the suppleness of skin and muscle, heal abrasions, give body and sheen to hair, and soothe the drying effects of sun and wind for centuries. As part of folk medicine, olive oil was used to strengthen weak nails, aid in digestion, cure the effects of alcohol consumption, relieve aching muscles, and lower blood pressure. Of course, olive oil is a key ingredient in the traditional Mediterranean diet, an eating style that for decades has generated much research regarding its health potential. “Extra-virgin olive oil is definitely critical to the health benefits of the Mediterranean diet. It’s been part of the Mediterranean diet since at least 3000 BC,” Flynn says. She reports that the olive tree originated in Asia Minor in 6000 BC; people in present-day Syria brought the tree to Greece. The Greeks brought it to Italy sometime before 1500 BC. The Romans largely were responsible for spreading the tree throughout the Mediterranean region as they expanded their empire. “Olive oil is a staple in the Mediterranean diet, which has for the first time been recognized as a healthy dietary pattern by the 2010 Dietary Guidelines for Americans,” says Clare Hasler-Lewis, PhD, MBA, executive director at the Robert Mondavi Institute. And that’s not all. “Olive oil has the highest quantity of alpha tocopherol—vitamin E that works as an antioxidant. And since extra-virgin olive oil doesn’t oxidize, the vitamin E can be used to stop other oxidation in the body,” Flynn adds. In addition, it contains lignans, a type of fiber that’s been related to decreasing breast cancer risk, and squalene, which has been shown to inhibit tumor development. And remember that some phytochemicals in vegetables, such as carotenoids and glucosinolates, are more bioavailable or better preserved when prepared with dietary fat such as olive oil. Many nutrition experts recommend that your first choice in oils—for cooking or cold preparations—be extra-virgin olive oil. Flynn agrees with this advice, adding, “Vegetable oils oxidize as they’re primarily polyunsaturated fats. Olive oil doesn’t oxidize, and it makes vegetables taste delicious, so it increases vegetable intake. In a study I did [Journal of Women’s Health, 2010] comparing a lower fat conventional diet to my plant-based olive oil diet—participants were asked to use at least 3 T a day of olive oil—I found that women ate more vegetables when they used olive oil to cook them, despite being told that vegetable intake was unlimited on both diets,” Flynn reports. It’s important to note that many of these health benefits have been linked with extra-virgin olive oil—not refined olive oil. Flynn explains that the distinction is based on the free fatty acid content and acidity of the oils. When it’s labeled “olive oil,” it’s more refined and lower in quality, thus it isn’t linked with the same health benefits. Encouraging people to choose extra-virgin olive oil helps move them toward a diet pattern that reflects healthful fat choices over low-fat choices. And teaching people how to properly choose and use California extra-virgin olive oil is a win-win strategy—you’re supporting the U.S. economy and using incredible agricultural resources while maximizing optimal health. Drizzled over salads, tossed into pastas, sautéed with vegetables, served as a dip for bread, and mixed into meat marinades, California olive oil can let the natural flavors and nutrients in foods shine. • U.S. Extra Virgin Olive Oil is virgin olive oil that has excellent flavor and odor and a free fatty-acid content, expressed as oleic acid, of not more than 0.8 g/100 g, and meets the additional requirements as outlined in §52.1539 as appropriate. • U.S. Virgin Olive Oil is virgin olive oil that has reasonably good flavor and odor and a free fatty-acid content, expressed as oleic acid, of not more than 2 g/100 g, and meets the additional requirements as outlined in §52.1539 as appropriate. • U.S. Olive Oil is the oil consisting of a blend of refined olive oil and virgin olive oils fit for consumption without further processing. It has a free fatty-acid content, expressed as oleic acid, of not more than 1 g/100 g, has acceptable odor and flavor characteristic of “virgin olive oil,” with a maximum level of 200 mg/kg permitted of total alpha-tocopherol in the final product, and meets the additional requirements as outlined in §52.1539 as appropriate. • U.S. Refined Olive Oil is the olive oil obtained from virgin olive oils by refining methods that don’t lead to alterations in the initial glyceridic structure (basic glycerin fatty-acid structure). It has a free fatty-acid content, expressed as oleic acid, of not more than 0.3 g/100 g, is flavorless and odorless, with a maximum level of 200 mg/kg of total alpha-tocopherol in the final product, and meets the additional requirements as outlined in §52.1539 as appropriate. 1. Using a round cookie cutter or the top of a glass, cut rounds from the watermelon slices. They should resemble the tomato slices but may be a little smaller. Lay out the melon and tomatoes on paper towels and season with salt. 2. Combine the feta, olive oil, and hot water in a blender and puree until smooth. Season with salt and a little freshly ground pepper (it may not need much salt depending on the saltiness of the feta). 3. On a large serving platter, arrange the tomatoes, melon rounds, and arugula overlapping slightly, and drizzle with the feta sauce. Roughly chop the oregano leaves and sprinkle over the top. Drizzle with a little more olive oil if desired, and serve. 1. Whisk together ingredients except for olive oil and cheese. 2. While continuously whisking, drizzle in olive oil and whisk until emulsified. Add blue cheese right before serving. 1. Drain tomatoes in a fine mesh strainer, and place in a medium bowl. Let stand for 5 minutes then drain off any accumulated liquid. 2. Stir in beans, olive oil, vinegar, rosemary, and minced garlic. Season to taste with salt and pepper and set aside. 3. Rub the cut side of the garlic clove onto baguette slices and spray with olive oil cooking spray. Grill over medium heat for a minute or 2 on each side or until nicely grill marked and crisp. Remove and let cool. 4. Place equal amounts of tomato mixture on each baguette slice and top with pine nuts and Parmesan. Cut about 1/2 inch off top and bottom of oranges, enough to expose flesh. Stand orange up on cutting board. Using sharp knife, cut down and around orange, removing skin and pith, until no skin or pith remains. Hold orange in one hand over a bowl. With other hand, run small sharp knife along right and left sides of individual sections, loosening and freeing them, one by one, from membranes. Continue until orange is completely sectioned. Discard membrane. Set sections aside.